When in the market for new tires, it is important to ensure you also receive a wheel alignment. 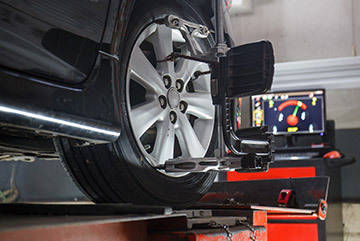 Wheel alignment maintains the lifetime of newly installed tires and provides a tracked driving experience. When should I receive an alignment? Inspecting the tire alignment can also uncover steering or suspension problems as well as drive line issues. Chabill’s Tire & Auto Service performs these diagnostics at no additional cost. Call us today to schedule your next wheel alignment in conjunction with your other vehicle maintenance needs. Chabill's Tire & Auto Service is proud to be the local auto repair shop and provider of tires nearest to you!